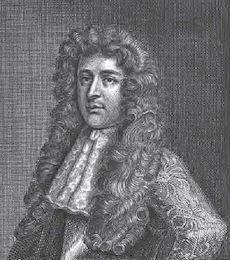 Whig knight Sir Thomas Armstrong was hanged, drawn, and quartered on this date in 1684, for adhering to Lord Russell‘s treasonable Rye House Plot. 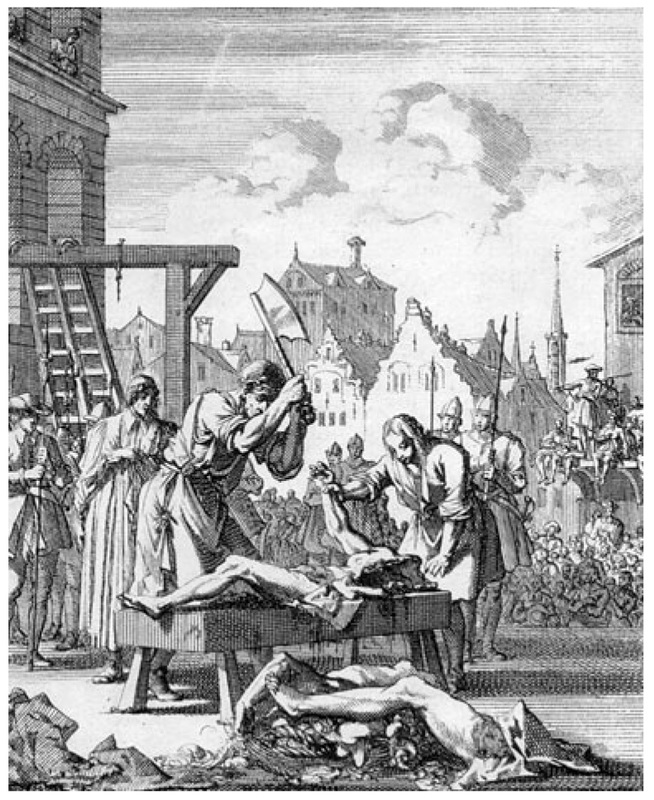 Armstrong had been tempting the executioner for some years: he fell foul of the Cromwell protectorate for shuttling funds to the exiled Charles II, and in 1675 he slew a Mr. Scroope at a theater brawl. Both times he kept his head. He would not be so lucky when conniving to kidnap the king. Briefly escaped to the Low Countries along with a number of other fellow-travelers,** Armstrong was arrested in Leiden and repatriated to face royal justice. 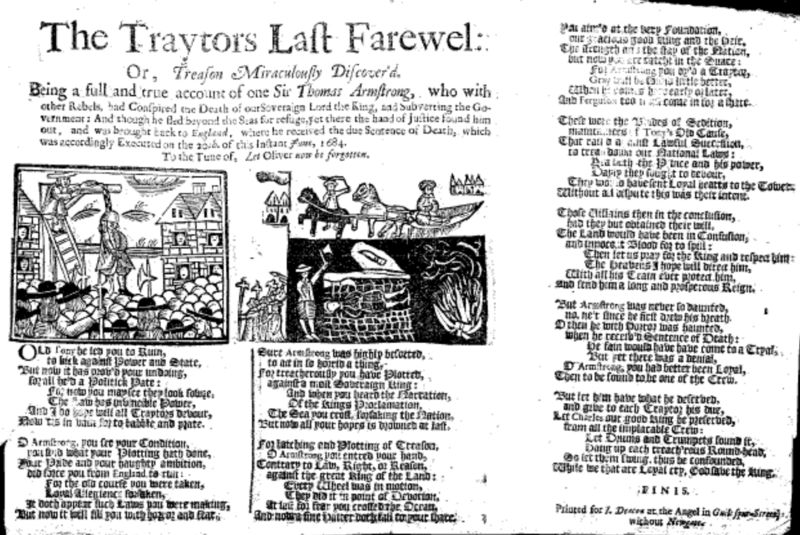 In an era of bitter factional politics spiced by burgeoning print culture, Armstrong’s delayed handling gave Tory squibs ample space to gleefully taunt the Whigs through him, and savor in doggerel (via repeat reference to executioner Jack Ketch) the inevitable rending of flesh that ensued. The Bully WHIG: OR, The Poor Whores Lamentation for the Apprehending OF Sir THOMAS ARMSTRONG. To the Tune of, Ah! Cruel Bloody Fate! &c.
Of all thy Crimes before? Will serve thy turn no more. As if thou hop’dst for more. And suffer in their room. Tom durst not shew his head. To pay for’t in the end. Hadst thou no Plots contriv’d. The ‘Squire shou’d foil the Knight! 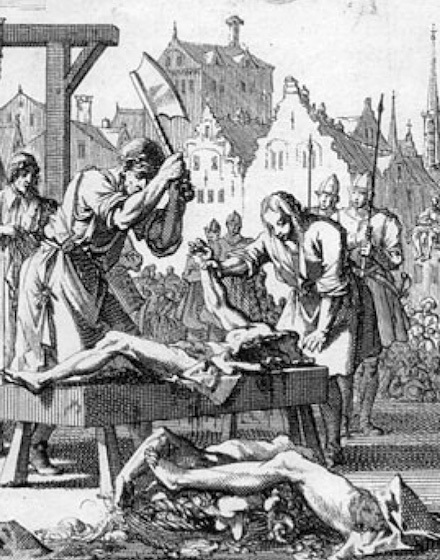 Sr. Thomas Armstrongs Last Farewell to the WORLD: He being Condemned for HIGH-TREASON, and Conspiring the Death of the KING and the DUKE, and subverting the Government of these three Kingdoms A SONG. For which I confess I deserve for to Swing. And told him how safe it was then to rebell. For which I before the damn’d Doctor must swing. I often as Grey have stood Pimp at the door. And leaves me no time to murder or mend. All Officers from the Plot Office advance. And Tony swore damn him, theres nothing so sweet. But sure I shall find some Friends where I go. The WHIGS laid open, OR, An Honest Ballad of these sad Times. To a Mery Tune, called Old Symon the King. And Treason of Forty One. To bring in their Good Old Cause. And all the Pious, &c.
As never was seen at Old Babel. And send it throughout the 3 Nations. Old Tony, Armstrong, and Scot. Was to do the Work o’the Lord. But when They’ve occasion we’ll Fight. Whilst now in the Tavern, &c.
And Pray for this Reformation. Of Charles, our Nations Defender. An Elegie On the never to be forgotten Sir Thomas Armstrong Knight; Executed for Conspiring the Death of His most Sacred Majesty, and Royal Brother, June 20. 1684. With some Satyrical Reflections on the whole Faction. For the great Bully of their Cause, is now no more. Ohone! Where’s all thy Pomp and Gallantry? Thy Great Commands, thy Interest and thy State? The many Crouds which did upon thee wait? That waits upon the hardened Reprobate. A just Reward for th’ base Rebellious man. And tumbled the Audacious Rebel down? How many Warnings have they had of late? How often read their own impending Fate? And know what Heaven has ordain’d their due? And may be stil’d the first Novel in Fame? Then dasht their Hopes, and damn’d them down to Hell. Curse their Fates, and Railing at the Laws. To a Whigg Brewers Youthful Lovely Maid. Had found enough so many Whores to please. Forewarn’d by this bold Traytors Destiny. Be Loyal, and make honest all your Wives. Keep all your Wives from Conventicling Men. Your foolish Prating, and more foolish Hate. Lest you partake of this bold Traytors Fate. I’le Crown the Work with this Inscription. But rose to an Hyperbole. He might have been the God o’th’ Vine. T’ out-cheat the Cheaters of the Town. His Vices too pray read below. Now Hang’d, and Damn’d, for his Rebellion. ** Notably joining Armstrong in continental refuge — and narrowly escaping recapture with him — were fellow plotters Lord Thomas Grey and Robert Ferguson. Both these worthies returned in power with the rest of the Whig party come the Glorious Revolution … an event for which Ferguson, a prolific pamphleteer, wrote the definitive justification.